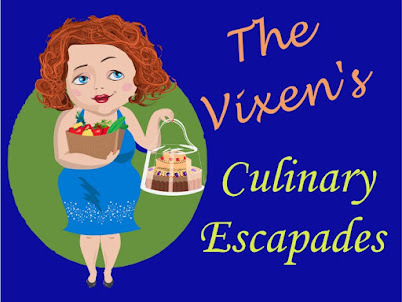 Welcome to the debut of The Vixen's Culinary Escapades! 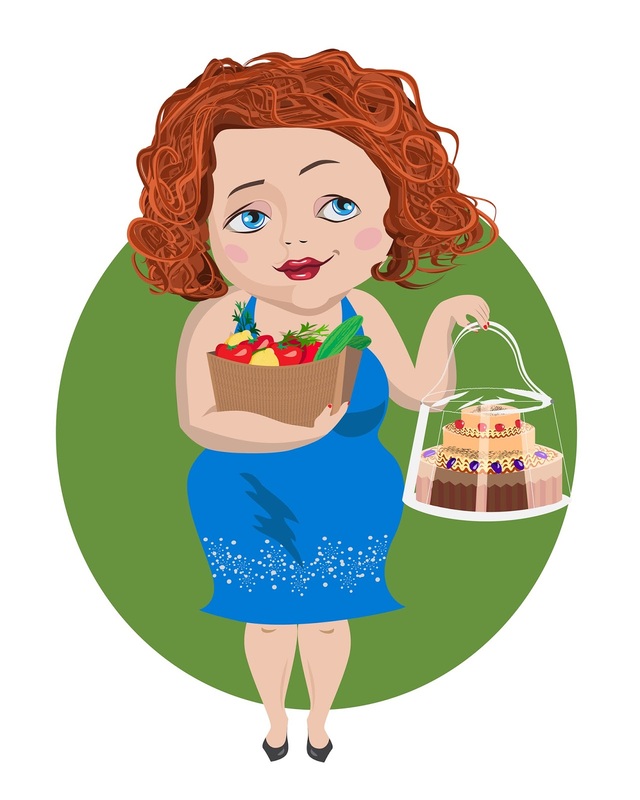 These posts are dedicated to my love affair with food. From creating my masterpieces and old favorites at home, to checking out the local favorites here in the Pacific Northwest, to trying out delicacies around the country—all will be included here. This started out on my Instagram account where I shared #foodporn photos. 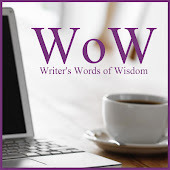 They've become quite popular along with the Cooking It Up with Authors feature I started on my sister blogs. I love sharing recipes of my favorite dishes and those of fan favorites. Maybe it's my Midwestern upbringing, but food plays a huge role in my life whether I'm celebrating or trying to hide away from the world. For my Evil Day Job (EDJ) as a veterinarian, I have to travel every week. Since I'm away from home and without a kitchen to perform my culinary magic, I have to rely on the local restaurants to wow me. This week I'd like to share one place in particular that has bowled me over and knocked my socks off. Did you watch the video? It's a great introduction to this fabulous place. 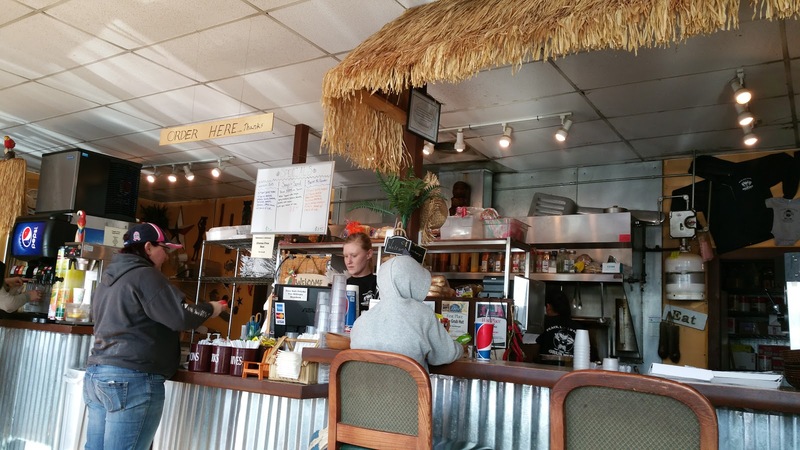 It's what some would call a cute little hole in the wall as it's not a huge place, but it's packed with everything you'd want in a local favorite. 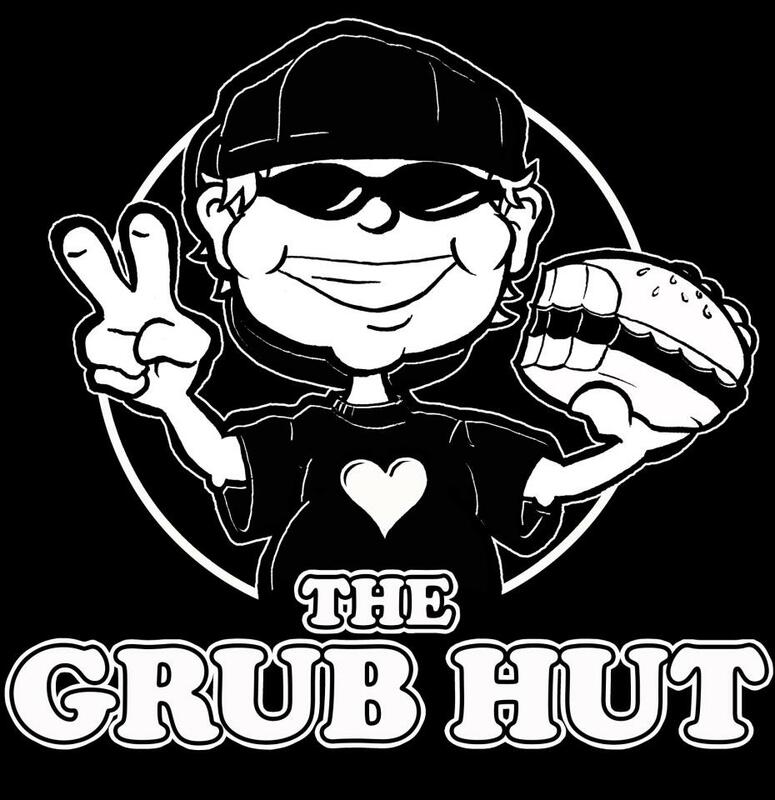 My husband has family who live in the area and The Grub Hut is their go to family burger joint. I'd driven by it multiple times going to and from the Kingston Ferry terminal. I kept saying we had to stop in there and check it out. When we finally did check them out for ourselves, my husband and I immediately fell in love with the place. They have a huge selection of gourmet burgers, salads, sides and super thick milkshakes and malts. You can substitute any meat patty or chicken breast with a veggie burger if you wish. 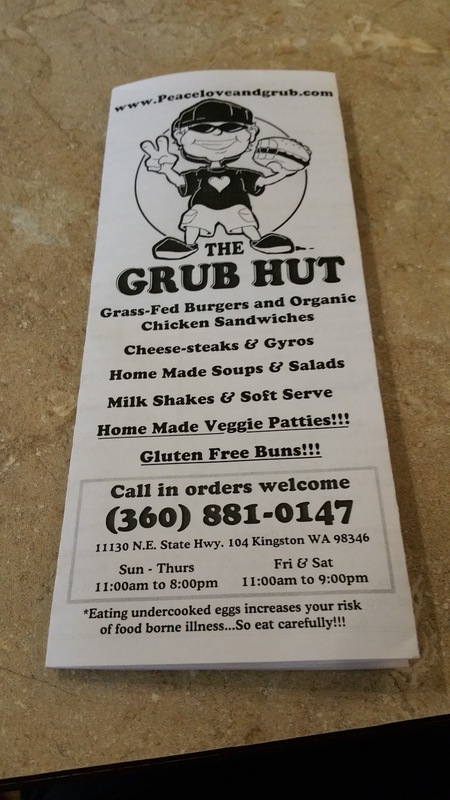 They also offer gluten free buns. There is something for everyone here and that's just what's listed on the menu. 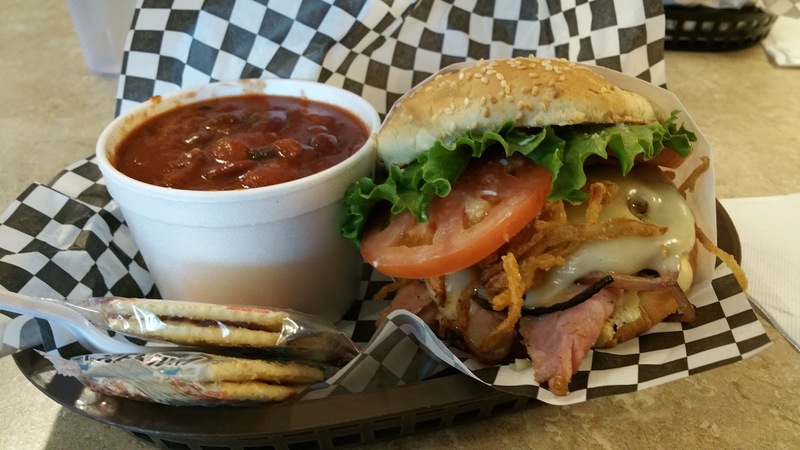 You can mix and match up the sides and have a totally different experience every time. 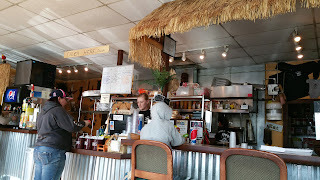 I discovered their veggie chili on our second visit and now I have that as my side dish instead of fries. Yes, you read that right. The Fry Queen gladly gives them up for the hot, savory chili. Normally I'm an all meat kind of gal, but the flavors of this chili blend so well together, I don't miss it one bit. The above photo was our first trip. Hubby chose the Old Fashioned and I got the Bacon Burger. Both are piled high with fixings and wrapped to keep it all in place as you bite into it. That's a must have for me because I'm always dropping half of my food down the front of my shirt if I don't wear a bib. LOL! 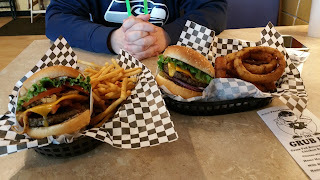 Both burgers were grilled to perfection: juicy and full of flavor. You can't say that about many burgers out there these days, but here you can rest assured you'll enjoy every bite. Now if you are one who absolutely needs your fries, be forewarned. A side of fries is a HUGE basket of them that the two of us couldn't finish. It's at least double to triple the amount that is in the above photo that comes with a burger. When you first walk in, you can place your order at the counter. If you choose to eat in, you then fill your drinks and find a seat. The Hutters will bring your your food as soon as it's ready. Be warned! This is a popular stop after the ferry unloads so you'll want to get in there as soon as you can. They have menus all over the place so my advice is to pick up a few for your car, purse, or wallet so you can figure out what you want before you walk in there. 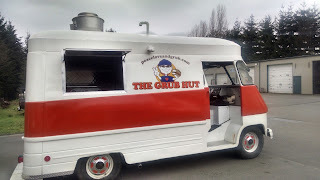 The Grub Hut has a food truck that travels around the area for events. If you can't make it to Kingston but want to get your grub on at your next family get together? 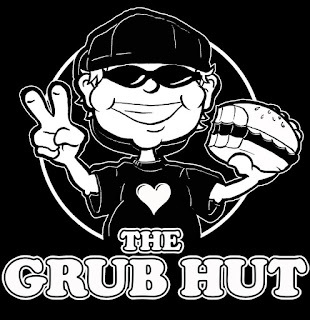 Check out their WEBSITE for details on how to get them to cater your event. The food is prepared right there on site. You can't ask for anything better than that! Go on and give this wonderful joint a try when your in Kingston. 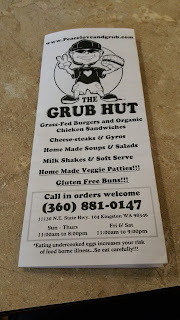 If you don't live in Washington, put this place on your MUST DO list when you come to the Pacific Northwest. Who knows? Maybe you'll find me and my husband in or booth scarfing down another bowl of chili and trying out another burger!